Water weight can artificially inflate how much the scale says you weigh. After all, a scale measures all parts of your body -- the muscle, bones, connective tissue, organs and fluids. In addition to increasing your weight, water retention can make you look puffy and feel uncomfortably bloated. If you have an occasion tomorrow -- a special presentation, photo shoot or sporting event -- for which your weight matters, you can take action today that will help you lose water weight overnight. Whatever you do, don't limit your fluid intake or resort to water pills, as these can lead to dangerous levels of dehydration. As counterintuitive as it seems, drink more water to reduce water retention. When you're dehydrated, your body retains fluid as a protective mechanism. Drink up to reassure your system that you'll keep your fluid levels in balance. This will help you flush out any excess water. If you tire of plain water, add a slice of citrus fruit or sip herbal ginger tea. Add a little parsley too, since it's a natural diuretic. Avoid rehydrating with sparkling water or sucking your fluids through a straw. You'll create air bubbles that can cause bloating. Be aware that drinking too much water can lead to a condition known as hyponatremia. 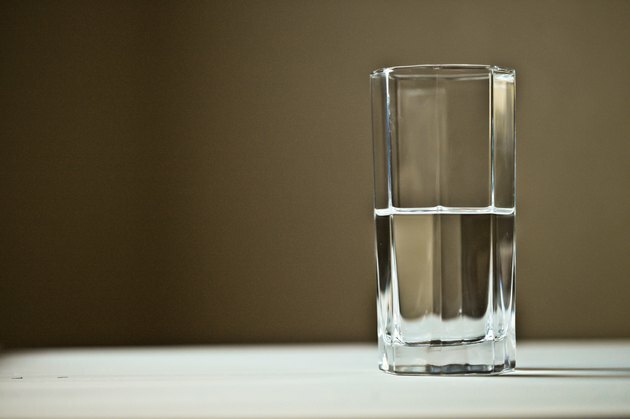 You basically consume so much water that your kidneys cannot work fast enough to flush it out, and the concentration of sodium in your blood drops below normal. Although rare, hyponatremia can result in symptoms such as severe headache, nausea, confusion and even death. It takes a water intake rate of more than 800 to 1,000 milliliters per hour -- or 27 to 30 ounces -- to overload kidney function. When you eat carbohydrates, your body processes them to be stored as glycogen in your muscles. Your body stores a little water alongside each molecule of glycogen. If you eat fewer carbohydrates -- especially refined and sugary kinds -- you can reduce your glycogen stores slightly and the accompanying water. Carbohydrates are essential for proper body functioning, though. Don't eliminate them completely -- continue to eat some in the form of watery, fibrous fruits and vegetables. The fiber in fresh produce helps you process stool, and with it, water. Also, fruits and vegetables, such as leafy greens, cucumbers, tomatoes and watermelon, contribute to your overall water intake so you're more hydrated and less likely to hold onto extra water. A high intake of salt causes you to store water extra water because your body tries to maintain a water-to-sodium balance for optimal function. If it senses too much sodium, you'll retain water to even out the concentration. Minimize your intake of salty snacks and restaurant meals for a day, and you'll lose some water weight overnight. Stick to whole, unprocessed foods -- such as plain, lean meats and vegetables -- which contain only naturally-occurring sodium. Use a no-salt seasoning mix and fresh herbs or vinegar to add flavor. Along with the usual high-sodium suspects such as deli meat, hot dogs, canned soups and frozen dinners, many seemingly healthy foods can also contain measurable amounts of sodium. For example, two slices of whole-wheat bread have 300 milligrams of sodium, 1/2 cup of canned peas has 230 milligrams, and an ounce of salted mixed nuts has 473 milligrams. Aim for no more than 1,500 milligrams a day when you want to reduce water bloat. You might be tempted to sweat out water weight with a hot, intense cardio session. A vigorous workout could actually lead to water retention overnight; aggressive exercise can produce tiny microtears in your muscles, and your body can respond to these by retaining fluid. Associated inflammation can also cause some fluid retention. A gentle workout instead, like a walk or easy bike ride, can help with circulation and might flush out excess water. Nestle: Does Your Weight Change From One Day to Another? Cleveland Clinic: I Just Started Exercising — Why Am I Gaining Weight? Why Do You Retain Water After Exercise?